The insulating substrate is a flexible insulating film. As the insulating carrier of the Circuit Board, selecting the flexible dielectric film requires a comprehensive investigation of the heat-resisting property, the coating performance, the thickness, the mechanical properties and the electrical properties of the material. Now commonly used in engineering is polyimide film, polyester commodity name Mylar) film and Polytetrafluoroethylene film. The general film thickness is selected within the range of 0.0127~0.127mm (0.5~5mil). The effect of the adhesive is to combine the film with a metal foil or an adhesive film and an overlay film.For different film substrates can be used different types of adhesives, such as polyester with a binder and polyimide adhesive sheet is not the same, polyimide substrate adhesive sheet epoxy and acrylic classification. The selection of the binder is mainly to investigate the fluidity of the material and its coefficient of thermal expansion. 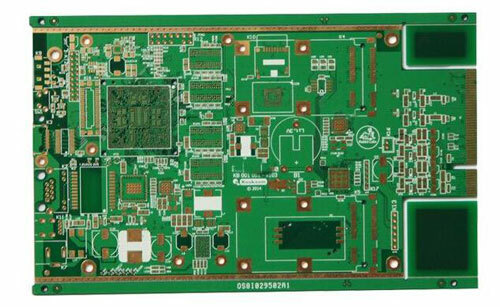 Non-bonded polyimide copper Foil Board, chemical resistance and electrical properties, etc. better. Due to the low glass temperature of the acrylic adhesive, the large amount of contamination in the drilling process is not easy to remove, affecting the quality of metallization hole, and other bonding materials, such as disappointments, so, Multilayer Flexible Crcuit interlayer adhesive commonly used polyimide material, because with the polyimide substrate, its Q CTE (thermal expansion coefficient) consistent, The problem of dimensional instability in Multilayer Flexible Circuits is overcome, and other performances are satisfactory. Copper foil is a conductive layer covering the insulating substrate, which is then selectively etched to form a conducting line. The majority of this copper foil is made of rolled copper foil or electrolytic copper foil. The ductility and flexural resistance of the rolled copper foil are better than that of electrolytic copper foil, the elongation of the rolled copper foil is 20%~45%, and the elongation of electrolytic copper foil is 4%~40%. Copper foil thickness is most commonly used 35um (1oz), also has a thin 18um (o.5oz) or thick 70um (2oz), or even 105um (30z). Electrolytic copper foil is formed by electroplating, the crystalline state of copper particles is a vertical needle, easy to form a vertical line at the edge of etching, is conducive to the production of precision lines; however, the needle-like structure is prone to fracture when the bending radius is less than 5mm or dynamic deflection. Therefore, the Flexible Circuit base material uses the rolling copper foil, its copper particle is, can adapt to many times around the curve.